John Buckford Henshaw5,6,7 [John Bickford Henshaw8, Bickford J. Henshaw9]. Maling, Thomas J., head-of-household, age 35, born Mar 1865 in Maine; parents born in Maine; married 10 years; occupation: messenger; rented home. Maling, Thomasena A., wife, age 30, born Apr 1870 in Ireland; father born in England; mother born in Ireland; immigrated 1881, U.S. resident 19 years; married 10 years; 2 children, 2 living. Maling, Henry F., son, age 8, born Sep 1891 in Massachusetts; father born in Maine; mother born in Ireland. Maling, Henrietta I., daughter, age 6, born Nov 1893 in Massachusetts; father born in Maine; mother born in Ireland. 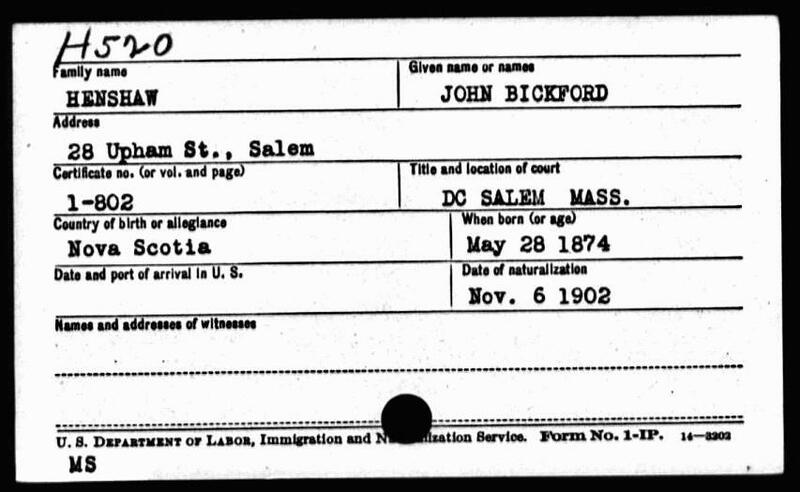 Henshaw, J. Buckford, boarder, age 26, born May 1874 in Canada; parents born in Canada; immigrated 1893, U.S. resident 7 years, alien; single; occupation: milkman. Henshaw, John B., head-of-household, age 35, born in Canada; parents born in Canada; immigrated 1891, naturalized; first marriage, married 7 years; occupation: dealer, milk; rented home. Henshaw, Henrietta R., wife, age 35, born in Ireland; parents born in Ireland; immigrated 1890; first marriage, married 7 years; 1 child, 1 living. Henshaw, Lloyd B., son, age 12 months, born in Massachusetts; father born in Canada; mother born in Ireland. Henshaw, Wallace L., brother, age 24, born in Canada; parents born in Canada; immigrated 1901, naturalized; single; occupation: driver, milk. Henshaw, John B., head-of-household, age 45, born in Canada; parents born in Canada; immigrated 1893, naturalized 1903; owned home (free); occupation: proprietor, milk business. Henshaw, Henrietta, wife, age 46, born in Ireland; parents born in Ireland; immigrated 1886, naturalized 1903. Henshaw, Lloyd, son, age 10, born in Massachusetts; father born in Canada; mother born in Ireland; attended school. 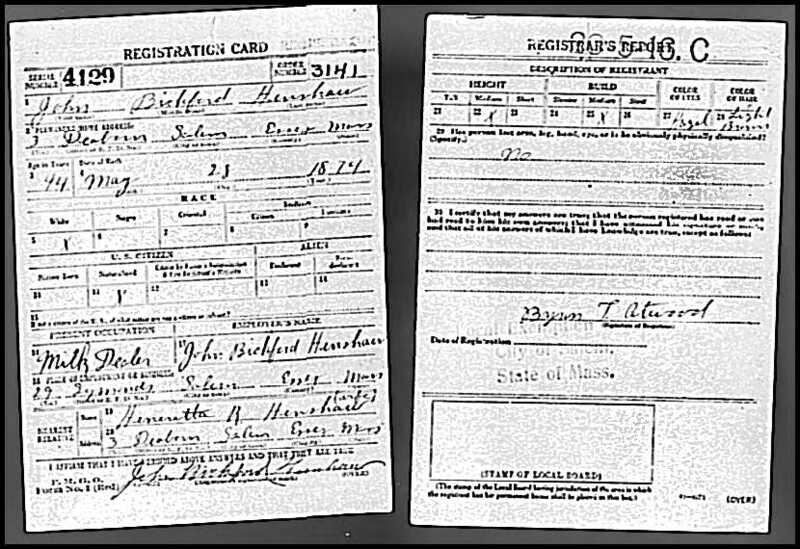 Henshaw, John B, head-of-household, age 55, born in Canada; parents born in Canada; first married at age 29; immigrated 1893; naturalized citizen; owned home ($4,000 value); radio in home; occupation: milk dealer, milk farm; not a veteran. Henshaw, Henrietta, wife, age 54, born in Northern Ireland; parents born in Northern Ireland; first married at age 28; immigrated 1894; naturalized citizen. Henshaw, Lloyde B., son, age 21, born in Massachusetts; father born in Canada; mother born in Northern Ireland; single; occupation: dairy, milk wagon; not a veteran. Henshaw, John, age 60; naturalized 1900, Salem, Massachusetts; U.S. address: 3 Denham Street, Salem, Massachusetts. Henshaw, Henrietta, age 60; naturalized 1912, Salem, Massachusetts; U.S. address: 3 Denham Street, Salem, Massachusetts. From the above it appears that John died in 1936 or 1937 (probably late 1936), and Henrietta died after 1952. Their burial places are unknown. 1910 census, Salem, Essex County, Massachusetts; roll T624-587, ED 475, page 6B, line #73, dwelling #107, family #142. 1920 census, Salem, Essex County, Massachusetts; roll T625-697, ED 278, page 9B, line #75, dwelling #136, family #209. 1930 census, Salem, Essex County, Massachusetts; roll T626-903, ED 267, page 3A, line #7, dwelling #36, family #54. Annapolis County births, 1874, #222. C-13172. 1881 census, Clementsport, Annapolis County, Nova Scotia; page 30 (age 6). 1881 LDS census index, Clementsport, Annapolis County, Nova Scotia; NA film C-13172, district 16, sub-district H, page 30, household #161. U.S. Naturalization Record Indexes, 1791-1992; http://www.ancestry.com. Obituary of John Edward Henshaw. T-6308. 1891 census, Clements West, Annapolis County, Nova Scotia; page 12 (age 16). 1900 census, 3rd Ward, Salem, Essex County, Massachusetts; roll T623-647, ED 447, page 10A, line #9, dwelling #175, family #246. Contribution from David Batchelor (). Boston Passenger and Crew Lists, 1820-1943; http://www.ancestry.com. 1930 census, Ward 6, Salem, Essex County, Massachusetts; roll T626-903, ED 267, page 3A, line #7, dwelling #36, family #54. Boston Passenger Lists, 1820-1943; http://www.ancestry.com.